Found 2 file extension associations related to Pogoshell and 2 file formats developed specifically for use with Pogoshell. 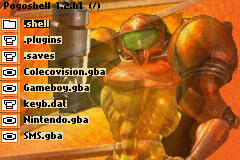 Pogoshell is a file manager for the Gameboy Advance. Really, that's an oversimplification. Pogoshell also includes a much better save management system than most flash cart frontends provide. Another big feature is plug-ins, a system of loading files through an association system. Finally, Pogoshell supports a theming system, offering a much more customable interface. If you need more information please contact the developers of Pogoshell, or check out their product website.